Nestled in the back of Duke Forest, more than 200 furry faces peek out of the trees and enclosures at the Duke Lemur Center (DLC), a research center for lemurs and other prosimian primates. That’s also more than 200 mouths to feed twice a day and that means a lot of food. In 2010, the DLC was fortunate to receive a grant from the Mary Duke Biddle Foundation to support the establishment of a vegetable garden for the purposes of supplementing the diets of the resident lemurs and for education. Starting in January of 2011, DLC conservation coordinator Charlie Welch and I starting digging into the hardpan clay of an old construction site and worked on incorporating organic matter and compost into the new raised beds. Sustainable and organic practices are a priority at the garden, so we chose to use a companion planting scheme for insect control and a host of other strategies. A 1,000-gallon water tank system catches run-off from the nocturnal lemurs’ building and feeds down into the garden via a garden hose. We haven’t run out of water, even during our toasty summers. DLC kitchen leftovers are recycled on-site to create compost for the garden and three happy vermicomposting bins also snack on the kitchen scraps. The number one question people always ask is “what do lemurs eat?” Besides specially formulated lemur chow, crickets and bamboo, lemurs eat much the same as what humans eat. Diet and preference depend on the species of lemur, but also on the lemurs themselves. They each have a personality of their own and it is a pleasure getting to know them as they howl and call across the center compound. Leafy greens, sweet potatoes, cantaloupe and watermelons are a few of the favorites, but the lemurs have been open to trying a few new items—squash and nasturtium flowers—with success in most cases. With the help of a number of dedicated volunteers, the garden has come a long way from a hardpan construction site. A deer fence now protects about 1,200 square feet of fertile growing space. 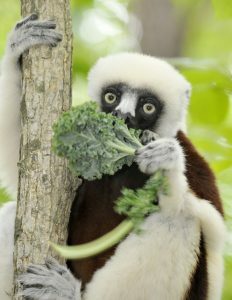 In the 2012 season, the garden produced approximately 285 pounds of lemur food and composted more than 1,500 pounds of kitchen leftovers. The garden looks to have a bright, productive future ahead as it helps the Lemur Center source more food on-site and reduce its carbon footprint. Tours of the Duke Lemur Center are available by appointment. Information can be found at lemur.duke.edu. Photo courtesy of David Harring.